The Cleveland Browns won their first game in over 635 days on Thursday Night Football against the New York Jets 21-17. Quarterback Baker Mayfield provided the spark the Browns have been searching for. Mayfield went 17-of-23 throwing for 201 passing yards and caught a pass for a two-point conversion. His performance cements himself as the quarterback of the future for Cleveland for many years to come. Cleveland was ecstatic to see their football team break its 19-game losing streak and win its first game since Dec. 24, 2016. The buzz around the National Football League (NFL) could be felt all over social media. 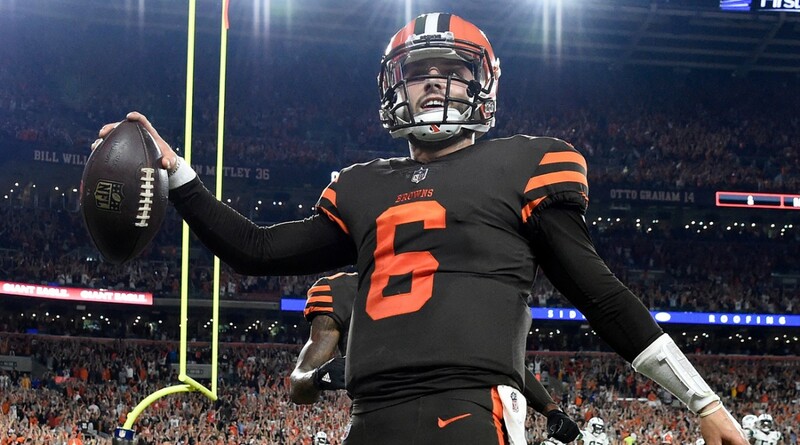 Browns fans and NFL nerds have been singing the praises for Mayfield ever since he was drafted with the first overall pick in the 2018 NFL Draft. Mayfield showed what he can provide for the Browns offensively compared to Tyrod Taylor, who left the game with a concussion. Taylor is not a bad quarterback by any means. He was one of the key catalysts that helped the Buffalo Bills reach the playoffs last year for the first time since 1999. The problem with Taylor is that he is a very conservative quarterback. He does not turn the ball over that often because he does not take many risks. That is not always a bad thing, but when your team needs a spark offensively, Taylor has shown inconsistency in leading a high-octane offense. Mayfield is the answer to that problem. He was fitting passes into very tight windows. He hit receivers with pace and accuracy that extended drives and led to scores. To be fair, Mayfield had his share of mistakes. He was fortunate that his fumble was recovered by a teammate, and he was also fortunate that one of his red-zone throws was not intercepted when he threw it right at the defensive-back. Mayfield’s confidence on the field is what draws people to him and combine that with his skill set as a passer he is poised to lead the Browns to at most eight wins this season. This all may seem like an overreaction considering the Browns’ history with quarterbacks taken in the first round: Tim Couch, Brady Quinn and Johnny Manziel. Mayfield is just that special. The advanced stats support his ability to become an extremely accurate passer in the NFL. Thursday night was a small sample size of his teammates feeding off his energy and his ability as a leader. The Browns defense is at least a top 10 level defense supported by a league-leading 11 takeaways. They have a good offensive line featuring Kevin Zeitler and Joel Bitonio. Jarvis Landry and Carlos Hyde are the only above average talents they have on offense, but Mayfield showed that he can make his teammates better with his arm strength and accuracy. Offensive coordinator Todd Haley displayed a specific package fit for Mayfield. Many of these plays are reminiscent of his time in Oklahoma including the two-point conversion where he caught a pass. Do not be surprised to see a lot of quick passing routes and run-pass option (RPO) designed plays to fully maximize Mayfield’s abilities. The only thing holding Mayfield back is Browns head coach Hue Jackson. He has an ability to take any shred of hope that the Browns have and ruin it for everyone. Jackson and the Browns have been synonymous with mistakes, but Mayfield has shown throughout his career that he is ready for any challenge that comes his way.